Tuffa manufactured a tailor-made steel diesel tank for one of our installation partners, Wiltshire based Southern Tank Services (STS). STS were approached by the UK’s largest independent multi-metals stockholder, Aalco, to provide diesel storage and dispensing gear for their Southampton depot. Aalco has a fleet comprising of wagons and LGVs delivering to customers across the South of England. In addition to their regular customers, Aalco in Southampton specialises in the supply of metals to the marine industry on the south coast. Southern Tank Services is a leading tank installation and fuel management specialist for both commercial and domestic work. They were approached by Aalco with the objective of managing the fuel supply for their delivery fleet. 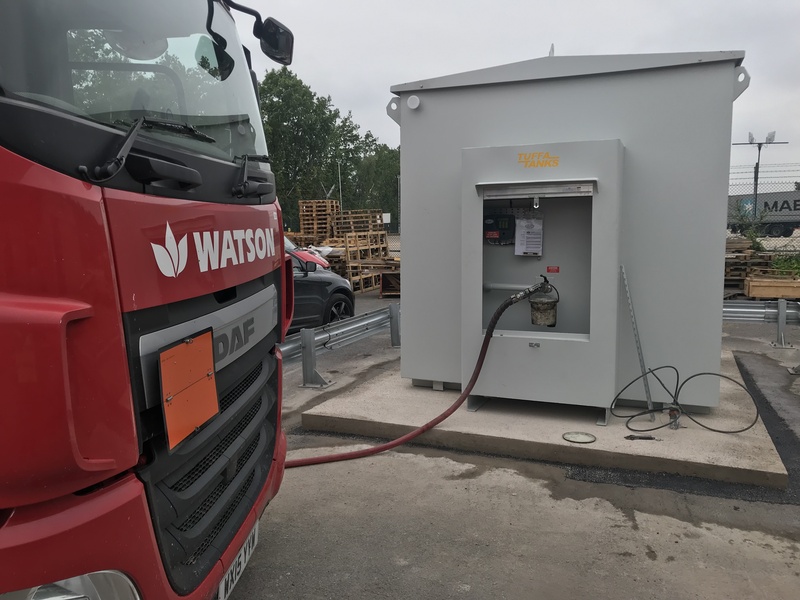 They needed a cost-effective solution for compliant, clean and reliable on-site diesel storage with a full Fuel Management System. STS provided a number diesel storage options for Aalco. Their preference was for a steel outer bund for security and heavy-duty longevity, with a plastic inner tank. This was to reduce the chances of condensation and moisture getting into the fuel. STS supply Tuffa Tanks so contacted us to see if we could help with this specific, custom-made tank. STS’s Chris Ford told us more: ”We had worked with Tuffa to produce bespoke tanks previously, so I called Dee Barcroft in the Tuffa sales team. Some tank manufacturers prefer to find a standard project for the job, but in this case we needed something more bespoke,” he explained. “When I asked Dee if Tuffa could produce a 10,000 litre diesel tank with a plastic inner and steel outer, she immediately said, ‘yes, we’ll find a way to do it.’ Tuffa designed a tailor-made tank in plastic and steel that gave us the best of both worlds,” he said. The Tuffa design and production team began with our existing roto-moulded 10,000 litre diesel inner tank. The steel outer was designed around this resulting in a solid 3m x 3m x 3m cube bunded steel diesel tank. The tank was fitted with a steel cabinet with roller shutter door to house the fill point, gauges, fuel management and 6m delivery hose with dispensing gear. Amy in our transport team organised delivery direct to site to coincide with a crane off-load. STS carried out the full installation of the diesel tank including all electrical work, laying cables and connecting to the pump. 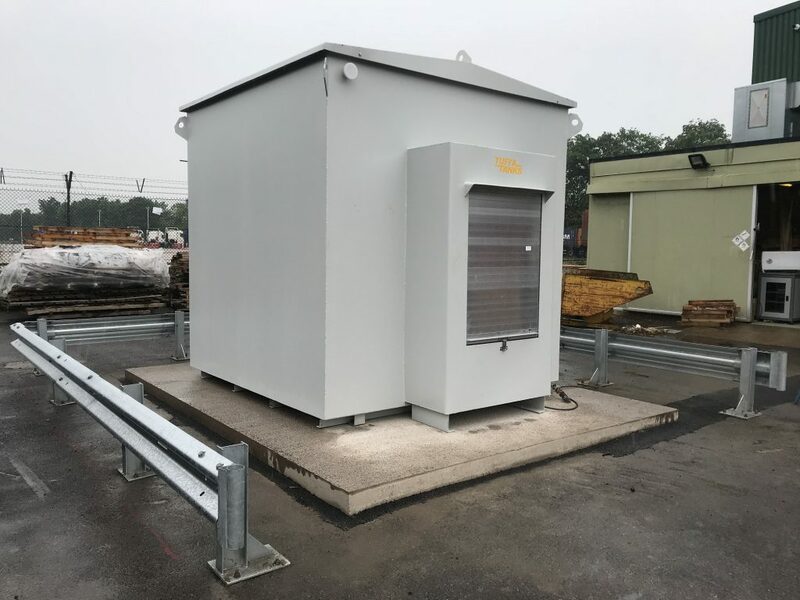 The Fuel Management System was installed within the cabinet on site by STS, who also constructed an Armco barrier around three sides of the fuel station for extra security. The tailor-made 10,000 litre diesel tank getting its first fill. Tuffa UK General Manager, James Shenton believes that this kind of collaboration gives customers a total service. “It’s vitally important that we can give our customers a personalised tank and a personal service. By working with installation partners like Chris and the team at STS, we can handle the entire project from design to manufacture right through to delivery and installation,” he said. 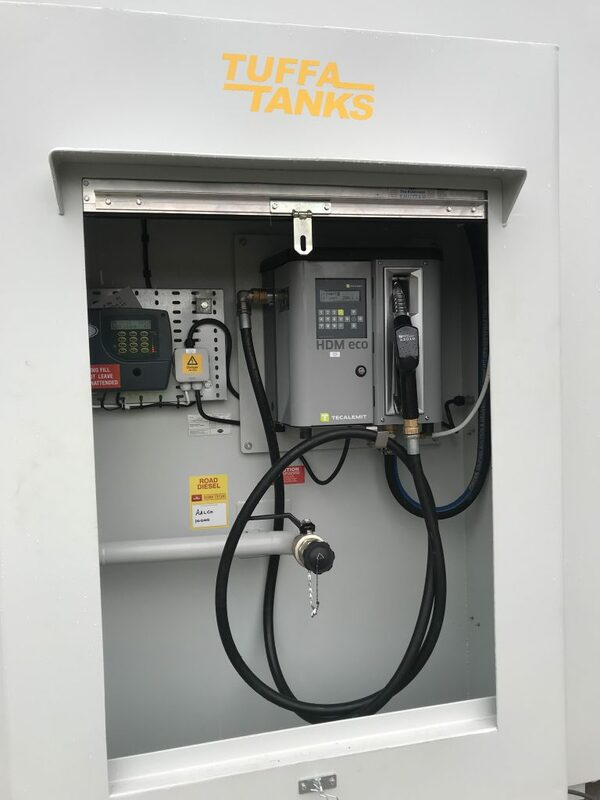 You can find out more about our range of diesel tank storage and dispensing options here, or call Dee or Mike in our sales team on 01889 567700 to discuss your specific fuel storage requirements.